I have been spending a great deal of time looking at the wonderful items available at ETSY and was surprised to find a number of Beadweavers using money as focals. I decided to find other etsy sellers using currency in their work. 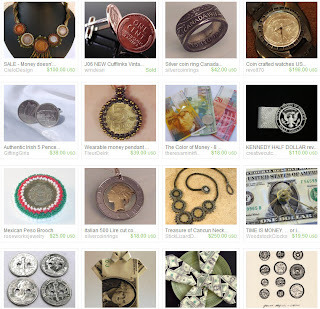 This treasury features wonderful items created using various forms of currency. Please visit the treasury at http://www.etsy.com/treasury/74c1e4a33b6136d91c32e3aba/the-color-of-money and check out these wonderful ETSY artists! This lovely treasury was curated by Lorraine of TrinityDJ (http://www.etsy.com/shop/trinitydj). Thanks to Lorraine for including my Easter Egg Earrings. She has selected some lovely items to include and I am sure she would appreciate you stopping by to comment and browse. 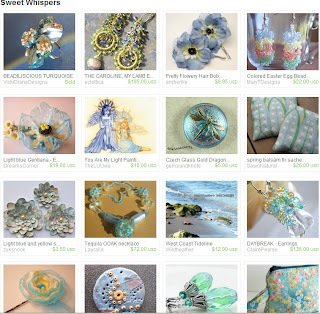 http://www.etsy.com/treasury/4c1f885dbd2f8eefc5704668/sweet-whispers#4c1fd637d0556d914754abe5. It's a lovely treasury - thank you so much for including me!